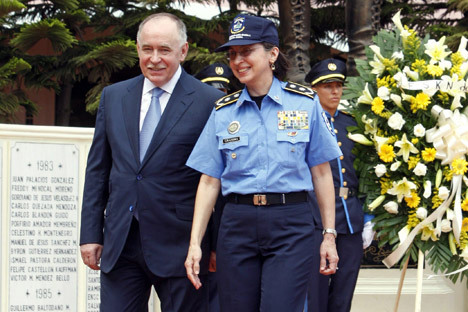 Viktor Ivanov strolls with Nicaragua Police Director (R) Aminta Granera in Managua. Source: ITAR-TASS. Viktor Ivanov wants a more muscular presence in world drug policy as United States officials dominate Central Asia. As the United States has stepped up its military and police assistance to Central Asia, Russia’s drug czar Viktor Ivanov realized he could sit in Moscow and brood, or gain a larger international profile by asserting a more muscular Russian role in global counter-narcotics. Choosing the latter, the peripatetic Ivanov, director of the Federal Drug Control Service, touched down in Peru, Argentina and Brazil as part of an ongoing effort to build diplomatic ties in Latin America while serving notice that there are voices other than Washington’s in setting drug policies. On the flight to Latin America on his well-appointed Bombardier jet, Ivanov, a box of chocolates at his side, discussed his philosophy with a pool of reporters. He said that he wants counter-narcotics to become a multilateral project, led by the United Nations, that would give international legal backing to the liquidation of drug production in Afghanistan and South America. But his goals in Latin America are twofold: intelligence and diplomacy. “I am alone with two faces, I am here as both Russian police and a representative of state structures,” he told reporters. Ivanov met with American officials who were traveling in the region. He also wanted to be seen at work in Washington’s backyard. Kremlin officials are concerned that the U.S. is militarizing counter-narcotics and that the deployment of Special Operations troops in Central Asia, no less than in Latin America, serves U.S. political and economic interests as much as it is an effort to interdict heroin or cocaine. “It feels as if the Monroe Doctrine swam across the ocean to our shores,” said Yuri Krupnov, director of the Institute for Demography, Migration and Regional Development, a pro-Kremlin think tank. Since czarist times, Russia has tended to think of Central Asia as part of its sphere of influence. Russia’s most serious drug issue stems from the flow of heroin along smuggling routes from Afghanistan through Central Asia and into the country’s cities. About five million Russian addicts consume about 70 tons of Afghan heroin annually. Cocaine from Latin America is a marginal problem in Russia with about half a ton sniffed each year by the wealthy elite. Ivanov has been spending some serious time south of the border. In the last year, he has visited Ecuador, Panama, Mexico and Cuba and signed a number of agreements on intelligence sharing. Ivanov was also in Nicaragua where he opened a Russia-funded anti-narcotics center that will train police and other security forces. Yet in bilateral meetings, he has criticized the U.S. Drug Enforcement Agency’s “heavy-handed methods of militarizing the region” and labeled as “insufficient” U.S. assistance to Colombia and Mexico. Ivanov insists that is not an anti-American mission. He has established a good working relationship with his U.S. counterpart, R. Gil Kerlikowske, the former Seattle police chief. The two met for coffee in Lima, Peru. Domestically, Ivanov wants to criminalize drug use and give addicts a choice between prison and forced treatment. “It’s the only way to stop the disaster,” said Evgeny Rogozin, the leader of a grassroots organization that backs forced treatment. Currently, illicit drug use in Russia is punished by a $175 fine or administrative arrest for up to 15 days. Opponents of criminalization said it is doomed to failure. “Mr. Ivanov’s views demonstrate a shameless disregard for science, public health and any sort of logical analysis,” said Ethan Nadelman, executive director of the Drug Policy Alliance, a New York-based group that supports decriminalization. Ivanov is acutely aware of the scale of the challenge. He recently read a disspiriting U.N. report that was also a call to action. On his last day in South America, he visited Santos in Brazil, the busiest container port in Latin America. One of the officials there told him “if we tried to open each container that would paralyze the entire port.” With the new use of submersible submarines to transport heroin, the job just got even harder for everyone. Anna Nemtsova is Moscow correspondent for Newsweek and The Daily Beast.